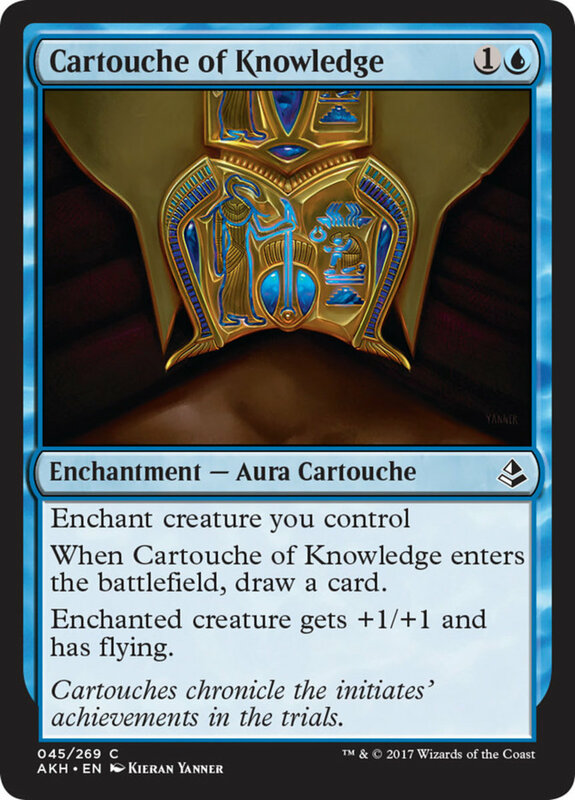 What Are Cartouche Auras in Magic? In Magic, cartouches are a special kind of enchantment that, like other auras, attach to a creature you control and offer them additional abilities. However, cartouches also have a secondary effect beyond buffing your troop, making them some of Magic's best creature-boosts, especially considering their low mana costs. As of this writing, only one cartouche exists for each color; which tablets reign supreme? These are the five best cartouche cards in Magic: The Gathering! 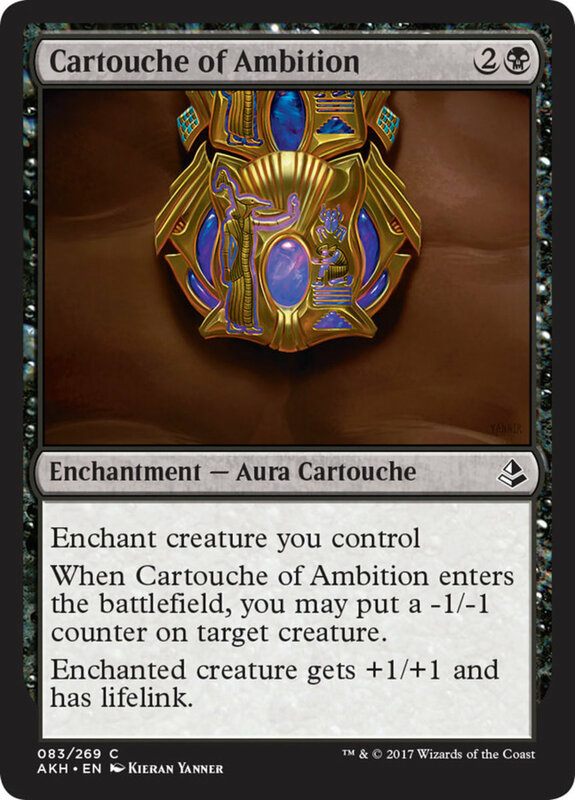 Even as one of the most expensive cartouches, Ambition still only costs three mana, and since only one has to be black, it easily blends into multicolor decks. When Ambition enters the field, you can place a -1/-1 counter on a creature, and Ambition's attached unit gains +1/+1 and lifelink, recovering you health whenever it deals damage. 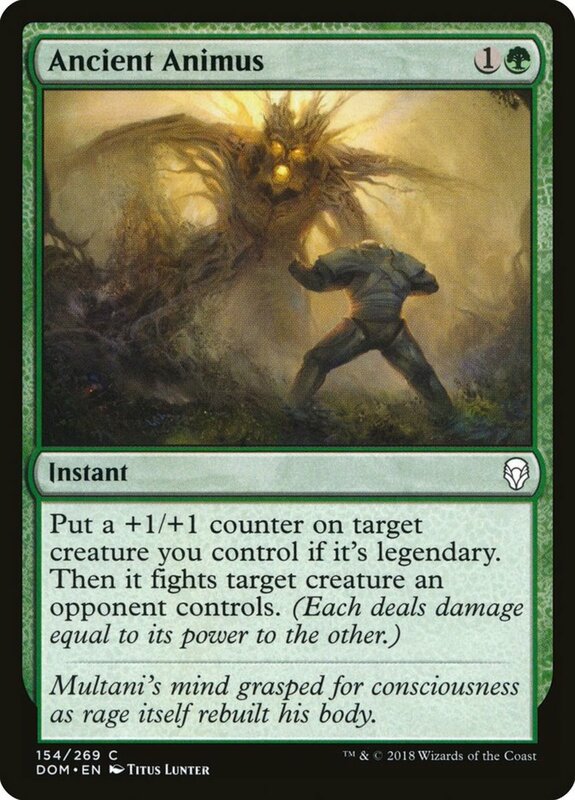 Both are nice effects, especially if you're using proliferate spells that can multiply the -1/-1 counters on enemies, weakening them until they die. Knowledge only costs two mana, and this hieroglyphic lets you draw a card when it enters the field, immediately replacing itself in your hand. It also grants your attached creature +1/+1 and flying, letting them soar over ground blockers when attacking. Three handy benefits for just two mana make this a worthy addition to any blue deck. 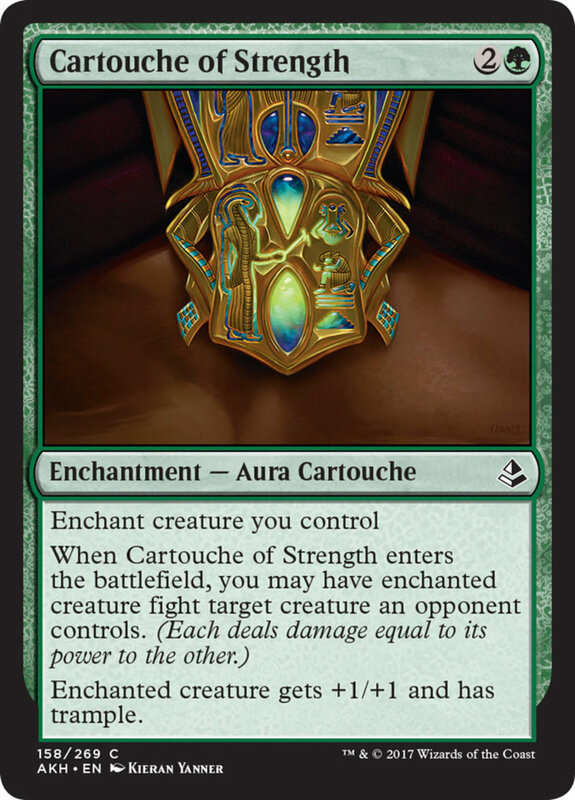 Cartouche of Strength costs three mana, but it offers a rare fight effect, letting your equipped creature deal damage to any opposing unit equal to its power (who also hits back). This forces weaker utility enemies into unwanted combat, eliminating your opponent's support line, and since Strength boosts your creature by +1/+1, it'll be well-equipped to triumph in battle. You also gain the trample trait, which won't apply in fights, but helpfully bleeds excess damage through blockers when attacking normally. 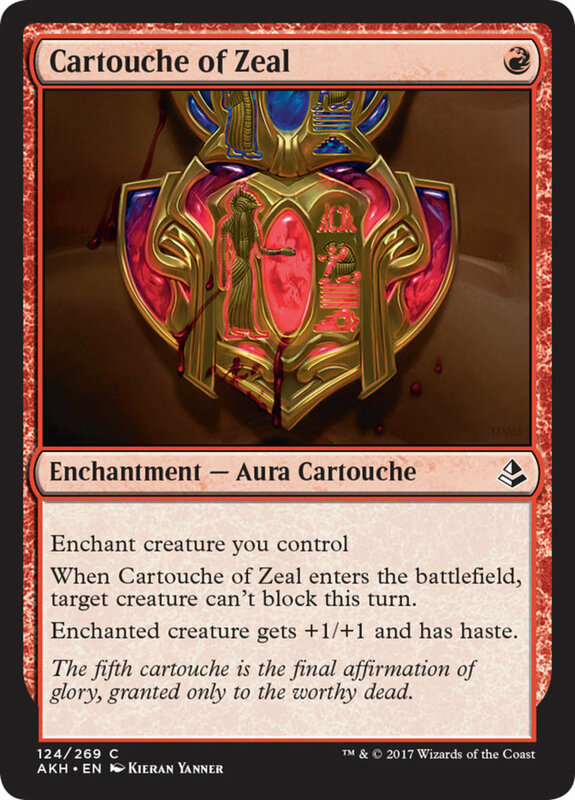 Cartouche of Zeal only costs one red mana, making it a prime bargain, and its recipient gains +1/+1 and haste, letting them attack or tap even if they just arrived that turn. Haste only really helps the turn a monster arrives, but it's still an appreciated bonus that you'll rarely find available on such cheap cards. In addition, Zeal prevents a targeted creature from blocking that round, clearing the way for your unit to attack without obstruction. 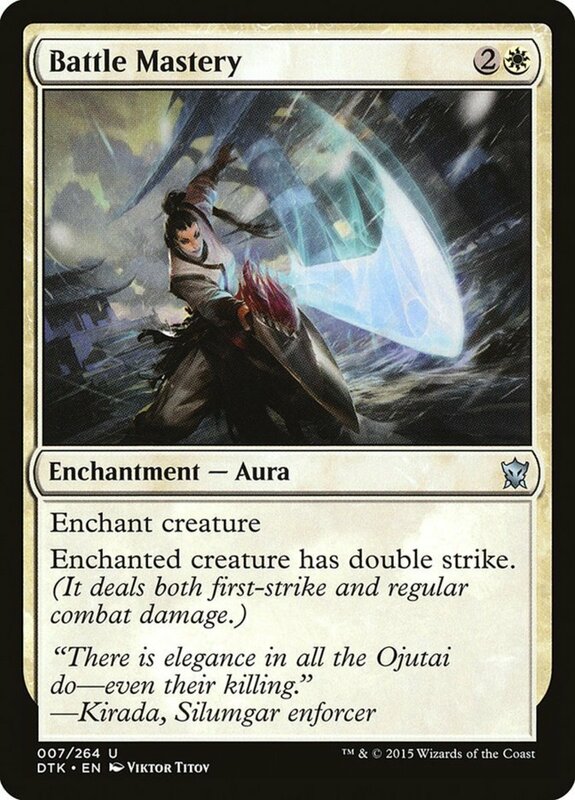 This helps land hits on your opponent, useful not just for reducing their life but also triggering direct damage effects, like those on the "Sword of" artifact equipment spells. 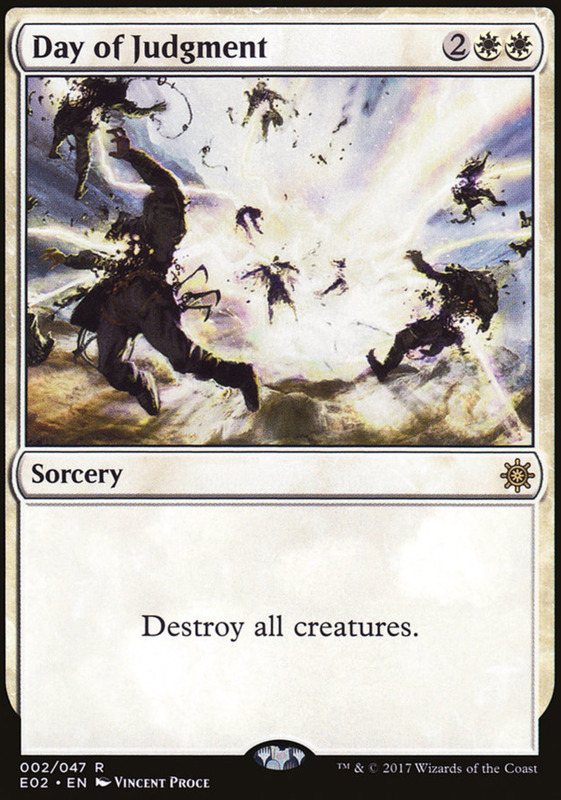 Like Zeal, Solidarity only costs one white mana, and it grants your creature +1/+1 and first strike, letting them deal damage first in battle (and avoid a counterattack if they kill their opponent). Combo first strike with deathtouch for a fierce blend that lets you insta-kill any creature before they strike back. Additionally, Solidarity also creates a 1/1 warrior token with vigilance, letting it attack without tapping. 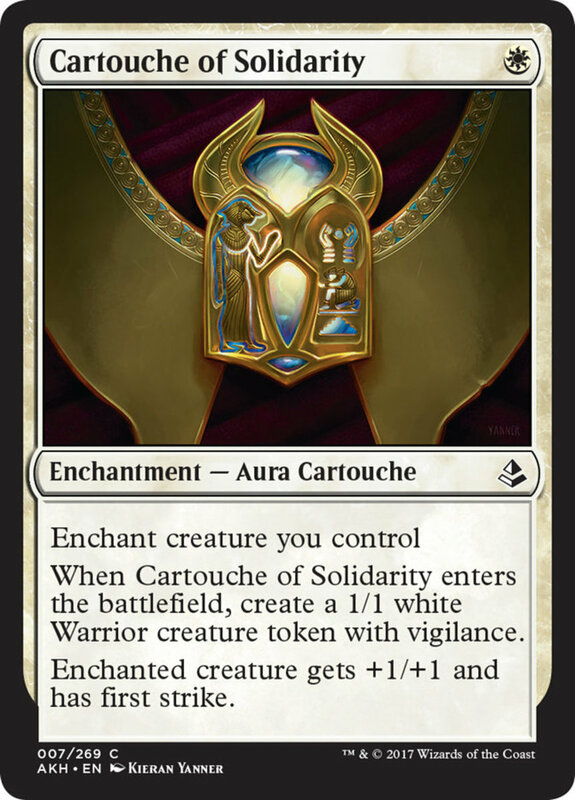 Basically, you're getting two for one here, obtaining both a creature upgrade and a low-level creature itself, making Solidarity an easy pick for just about any white structure I craft. Fortunately, despite its powers, Solidarity won't break the bank, costing less than a single dollar! Cartouches are already impressive on their own, but you can further boost them with the "Trial of" spells, enchantments that contain a single member in each color. These activate an ability when they enter the field and are returned to hand whenever you play a cartouche, letting you recast them (and resolve their entrance effects again). 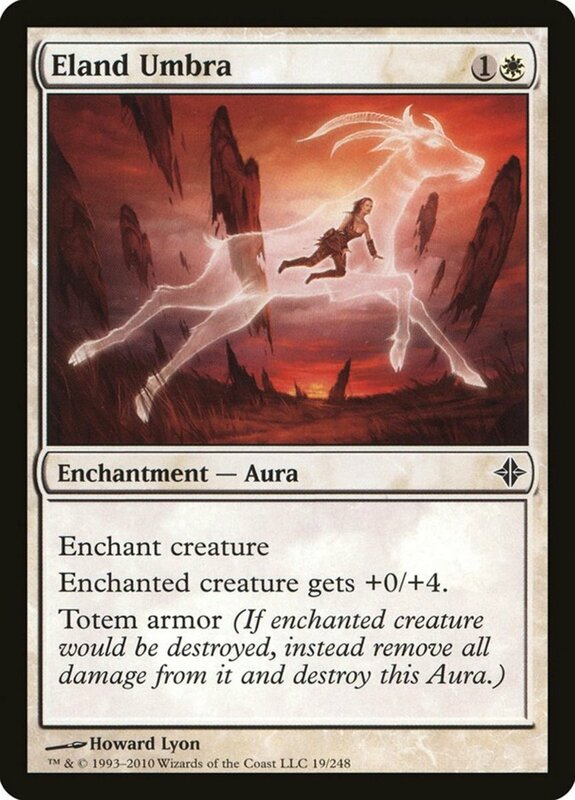 Cartouches and Trials remain some of my favorite enchantments in Magic that I definitely recommend testing yourself, but for now, as we eagerly await Wizards of the Coast's next expansion of creature-boosting auras, vote for your favorite card and I'll see you at our next MTG countdown! What are other groups of Magic cards with one entry in each color? Some examples of mini-sets with one card in each color include the "Siege" enchantments and "Sun's Zenith" sorceries. 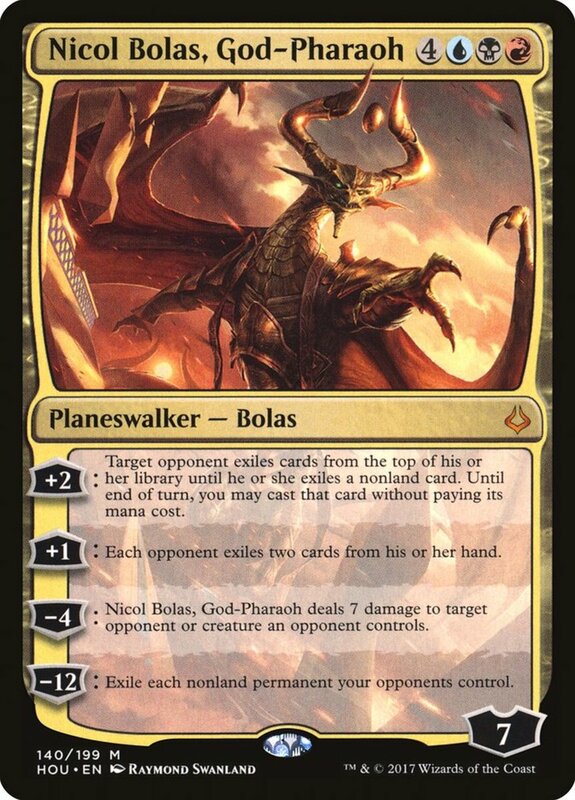 Each color's primary planeswalker (Nissa, Jace, Liliana, Chandra, and Gideon) also have a creature-to-planeswalker transforming card available, but these are just a few examples of what you're describing.